The London Piano Institute is pleased to inform you that we are now also offering piano lessons in Mayfair, in a prestigious setting, a few moments away from Grosvenor Square and Park Lane. As for our piano lessons provided in the City of London, our outstanding world­-class piano instructors always insure to provide the highest quality of piano education to all piano lovers, from absolute beginners to advanced amateur pianists. As an adult, it is of the utmost importance to choose the right establishment, and piano instructor, to start your piano education or improve your current level of piano playing. To begin with, it is essential to choose an environment in which you can feel at ease. 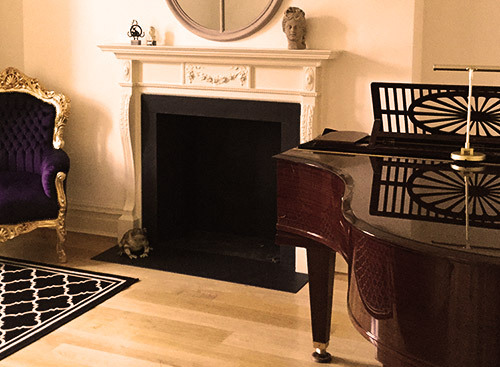 We have carefully selected the location and the interiors of our piano studio in Mayfair, to ensure that you will always feel relaxed during your piano lessons, and that every lesson can be a source of pleasure. The piano lessons with our master instructor Celine Gaurier-­Joubert take place on a remarkable Bechstein grand piano, and her assistant teaches on a fantastic Goetze grand piano manufactured in St Petersburg. Both rooms being located in a spectacular apartment decorated in a stylish manner. Taking piano lessons with world­-class instructors is necessary if you wish to benefit from a wonderful piano education. It must be taken seriously from day one, to avoid any bad habit to develop over time. Celine Gaurier-­Joubert and her assistant specialise in teaching adults, and you will immediately realise that their experience and extremely high standard of competency has not been equalled in London. They are both international world-­class musicians, who have decided two decades ago, to pass their incredible knowledge of the instrument to pianist amateurs. Our piano lessons in Mayfair are structured differently for each student, as we believe in a tailored education that could suit each individual, depending on their current level of piano playing and personality. Psychology is also crucial in teaching the piano to adults, and we always ensure to adjust our methods of teaching to each individual. Lessons take place from Monday to Saturday with Celine Gaurier­-Joubert herself, or her assistant, depending on your wishes and availability. In addition to your piano lessons taking place weekly on a set day and time, you will benefit from exclusive music events, piano recitals, master­-classes and piano workshops, for you to work through all the facets of music playing, and have the opportunity to connect with like-­minded piano lovers. The London Piano Institute has now been chosen by hundreds of Londoners, and even international piano lovers who travel from all parts of the world to benefit from the extraordinary expertise of our piano instructors. Most of the students who had to leave the UK after signing up at The London Piano Institute, now continue their piano course with us over Skype, as they have not found any instructor of the same pedigree in the country where they have relocated. Our master instructor Celine Gaurier-Joubert is an absolute master at teaching adults how to play the piano. She offers world-class piano instruction for adults in a formidable setting. She knows how to motivate you to learn how to practice and play the piano. In addition to weekly piano appointments, you will also benefit from regular student events, concert and masterclasses. Learning the piano in the right setting is absolutely essential. At our Mayfair location, you will learn how to play with a master pianist who genuinely cares for your progress on a beautiful grand piano. The lessons take place in a stunning setting designed to help you enjoy your piano lessons. Learning to play in the right atmosphere is absolutely key and that is exactly what we insist upon in our Mayfair piano studio. Forming the right habits from the first day is imperative. Learning to play requires expert attention. You need to learn how to read notation properly as well as how to play the instrument with the right technique. At the London Piano Institute, you can be assured of learning the right methodology from day one. At our Mayfair location you will not be disappointed. Your piano progress will skyrocket as long as you practice and do the work required. For the highest quality piano instruction for adults in Mayfair, contact us today.